Loading Dock Equipment | Overhead Garage Doors by Doorways, Inc.
PIONEER Loading Dock Equipment manufactures and distributes a wide range of loading dock equipment. Pioneer is centrally located in Spring Hill, Tennessee and has been one of the leading manufacturers of quality loading dock equipment for over twenty-five years. Pioneer products are top quality and compare favorably to all competitors. Versatile Top-of-Dock Levelers are perfect for retrofit situations where there is no existing pit, and working range requirements exceed those provided by Edge-of-Docks. Easy to operate. Our simple, straightforward design means fewer moving parts — making operation easy, while reducing the cost of maintenance and repair. Keep weather outside where it belongs and help save on energy costs. Available in most popular colors and fabrics such as Vinyl, Hypalon and Neoprene. Options include wear shingles, tapered units, galvanized metal hoods, and more. Durable PIONEER Levelers are available in virtually every length, width and capacity configuration. Safe. Dependable PIONEER products put safety first, providing maintenance struts as a standard feature on all P-Series Levelers. Rugged, Edge-of-Dock Levelers are available in standard capacities up to 30,000 lbs. in 66″ or 72″ widths. PIONEER also provides 78″ and 84″ width models. All models are available with or without bump blocks. Long-Lasting. Fine crafted PIONEER Levelers offer maximum deck strength and durability to help eliminate deck failure. 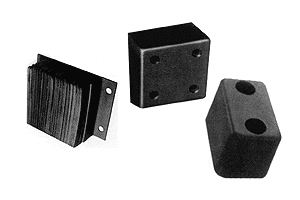 Laminated and molded rubber construction available in a broad array of sizes and shapes to fit your particular needs. Designed to protect costly door tracks against forklifts. Available in 24″, 36″ and 48″ heights.